Are bulging App Stores overrated? Could you manage with only three third party (i.e. add-on) applications? And if so, which ones would they be? Steve Litchfield conducts a spot survey! The genesis of this piece came from the realisation that modern phone app stores (think Apple App Store, Nokia's Ovi Store, the Android Marketplace, etc) are filled with pap. For every really good piece of software there are nine other 'entries' in the store which are worthless to 99.9% of users. You only have to browse through the store that's relevant to your device to see this effect at work. Then consider that of the 10% of 'good' applications, many of these will be somewhat niche in their applicability or interest. For example, of the iPhone App Store's 60,000 stated applications, 'only' about 200 are of direct interest to me, in terms of quality and scope. (That number is still more than the iPhone will allow someone to install, but that's beside the point!). In other words, 0.3% of applications in the store. For Nokia's Ovi Store, I'd estimate the fraction to be slightly higher, maybe 2%, or around 30 applications. The numbers are still very low, as you can see. But, and this is the 6 million dollar question, is any of this a problem? Leaving aside the issue of users having more problems trying to find good apps in a store that's bloated with rubbish, my postulation is that with the amount of functionality/apps built into each smartphone platform, and with so many useful services running happily in mobile-optimised form in a phone web browser, do people need many third party applications at all? My theory was that most people would be quite content with just three extra add-on applications - for Symbian OS, at least, in view of the wealth of apps that are built-into most S60 phones now (everything from image editing to podcatching to internet radio to mapping, it's all there out of the box, it seems). Other platforms have different needs and I'd estimate the number of third party apps needed to bring a Windows Mobile, Blackberry, Android or iPhone device up to the same functionality level to be around five or six for most people. But, even if my theory was right, which three apps? Would most people go for the same three? Or would there be wide variance, rather disproving my theory in a different way? So, via the magic of crowd-sourcing that is Twitter, I asked my following "You own (any) phone: you're allowed THREE third party (i.e. Non-built-in) applications ONLY. Which three can you not live without?" the very fact that I asked for the spot survey on Twitter means that everyone responding was a Twitter user and thus almost certainly had a (favourite) mobile Twitter client installed. there's a slight bias towards Symbian handsets among my Twitter following, because of my 'All About Symbian' infamyfame. there were almost no games nominated - but then my use of the word 'applications' heavily skewed people into thinking of serious programs. As to whether anyone couldn't live without a particular game, that's a discussion on addiction for another time! It's telling (and an endorsement of my 'three apps' theory) that there were three applications head and shoulders more popular than any others. It could be stated that "give new users the 'Litchfield Pro Pack' (for want of a better name!!) of Gravity, Google Maps and Opera Mini, and their ongoing need for any more software will be dramatically reduced". So I was both right and wrong. 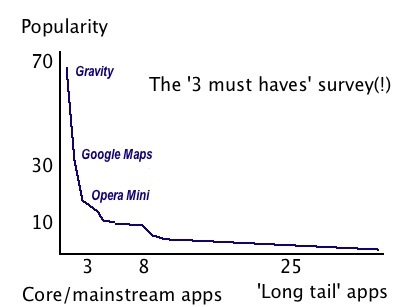 Yes, most people's needs can be satisified most of the time with just three applications and the choice of which three doesn't vary enormously (witness the number of people who chose both Gravity and Google Maps). However, there is a need for App Stores and sources of vertical applications, of specialist utilities, obscure reference works, and so on. The variety in personal needs and interests ensures that variety if also needed in any application store! My 'three apps that I couldn't live without'? For the record, 'Gravity' (yes, me too! ), 'Google Maps' (ditto) and 'Handy Safe Pro'.